A Roman frontier which is Scotland's answer to Hadrian's Wall could be awarded World Heritage site status. 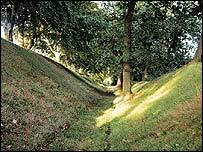 The Antonine Wall runs from Bo'ness, near Falkirk to Old Kirkpatrick in West Dunbartonshire. It was built in 140 AD to keep Scots warriors out of the Roman Empire after the conquest of southern Scotland. Now Historic Scotland hopes to attract thousands of tourists each year to see the turf wall by securing protection from the United Nations Educational, Scientific and Cultural Organisation (Unesco). The 37-mile (59km) long wall was named after Antoninus Pius, Roman emperor for 23 years from 138 AD and adopted son of the emperor Hadrian. It replaced Hadrian's Wall, in Northumberland, as the northern frontier of Roman Britain, despite being only half the length of its predecessor. 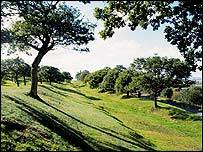 The Antonine Wall was abandoned in 160 AD and ruined parts of it survive to this day in Falkirk, Kirkintilloch, Polmont and Bearsden. But much has been bulldozed to make way for houses, factories and roads. Dr David Breeze, of Historic Scotland, said the wall would have been about four metres high with a ditch on either side of forts housing legionaries every two miles. About 8,000 soldiers would have been needed to patrol the ramparts to repel potential invasions from rebellious Scots. "These soldiers would not have been Romans from Italy. "We have an inscription from a tombstone which reveals the fact that the soldier (whose tomb it was) was a member of one of the tribes of the Brigantes from the north of England. "This is a very good example of the recruitment of the Roman Empire - most of the people in Britain would have been Britons, Gauls or Germans." Dr Breeze said despite an initially large military presence, the wall was abandoned 20 years later after Antoninus Pius was replaced by Marcus Aurelius. "A good example of the recruitment of the Roman Empire"
"He had taken over a military dictatorship and he had not been in the military and he needed to show he was the best. "He took this forward and proclaimed himself conqueror and got his military grounding. "The next emperor had already done that and so he pulled away from it." The Antonine Wall bid forms part of a joint application with Austria, Germany and Slovakia to secure protection for the empire's boundaries, which stretched from Iraq to the Black Sea. The bid's success should be known within three years. Hadrian's Wall became one of only 600 World Heritage sites globally in 1988 and currently attracts around 1.25 million visitors per year. Dr Elaine Murray, deputy tourism minister, said the bid was "excellent news" for tourism in Scotland. She said: "Scotland's wealth of culture is a major draw for tourism, our biggest industry. "Our world class natural and culture heritage is essential in maintaining and improving our share of the tourism market, and we are committed to ensuring it remains in good condition and receives the recognition it deserves." Scotland's four current UNESCO World Heritage sites are Edinburgh's Old and New Towns, St Kilda in the Western Isles, New Lanark, South Lanarkshire and parts of Neolithic Orkney.